Home > Crochet > Free Crochet Patterns > Crochet Egg Cozy Pattern … Easter Table Decor! Crochet Egg Cozy Pattern … Easter Table Decor! 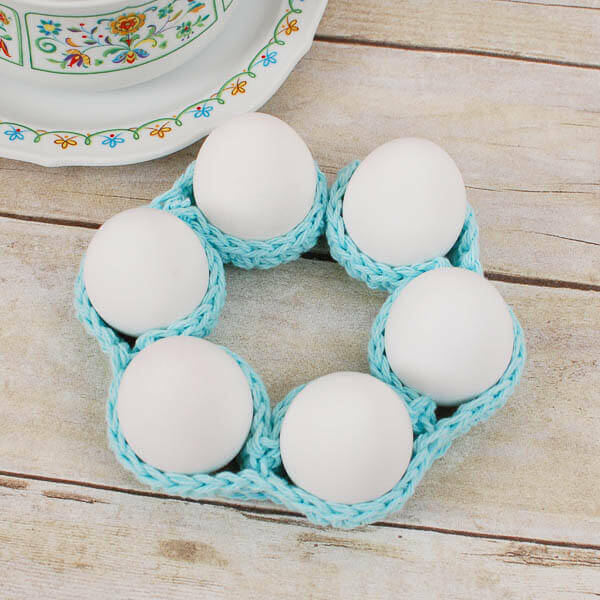 This crochet egg cozy pattern is so super easy and gives you a great decor bang for your efforts! And it’s perfect for beginner crocheters too! I love how this cozy looks on my Easter table weaving around the dishes and platters. You can use the cozy to arrange your eggs in a straight line, swirling around, in a circle, or any way you’d like. I have written up the pattern to work with both a half dozen and full dozen eggs and have also included notes so you can adjust it to fit your own amount. And best of all, you can use it again year after year! As written, the pattern will accommodate 6 (12) extra large eggs (you can add 16 additional chains for each egg you want to add). Row 1: Work 1 sc in 2nd chain from hook and each st across, turn — 106 (202) sts. Row 2: Work 1 sc in each st across, turn — 106 (202) sts. Row 3: Work 1 sc in each st across — 106 (202) sts. Fasten off leaving a tail of about 6 in. Fold strip in half so that it lays flat. Using the long tail and a yarn needle, stitch the two short edges together to form a large circle and weave in end. Flatten again. *Cut another length of yarn approximately 6 in. and thread it through a yarn needle, starting from the sewn end, count across 8 sts, sewn through both layers at 9th stitch and weave in ends; rep from * 4 (10) more times. Now just nestle your eggs in and decorate your table. Oh, I love this! Clever idea. Would look nice circling whatever the table center piece is/will be. Pinned! Such a cute pattern. Makes me wish I crocheted. Pinned to my board for others. 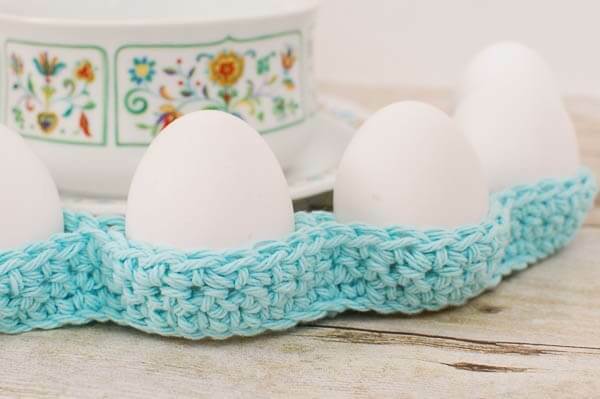 I love love love this egg cozy and I’m trying this myself! Thank you for sharing it! Wow, this is such a classy way to display your eggs. LOVE it! I love all your Easter patterns! !